A couple of months ago I attended a workshop focused on a Human Health and Wellbeing Climate Adaptation Plan for Queensland (H-CAP). This followed the National Strategy for Climate Health and Well-Being. It was a very interesting discussion, particularly as it highlighted the vision of other groups with whom I rarely spend time with. From the perspective of urban planning and design we generally think about longer term mitigation and adaptation strategies, while focusing on active lifestyles, social inclusion, healthy eating, and so forth. It was very interesting to see the imediate responses from health sector and their concerns. All absolutely legitimate, but from a completely different perspective. It was great to see so many passionate people, but also sad to see how some systems don’t work. 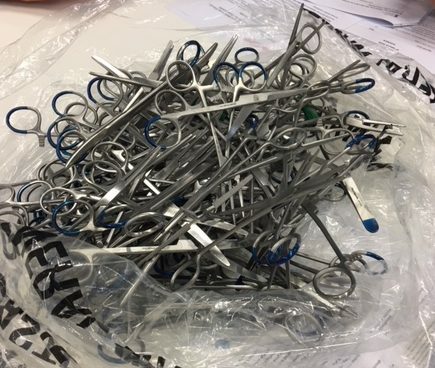 The scissors on the photo above, for instance, were used once and disposed because some local hospitals don’t have the sterilization facilities anymore. Yes, someone found that was a good idea! There is a discussion paper available online. This paper introduces the purpose, process and rationale for the development of the H-CAP for Queensland. It provides an overview of the literature in relation to risks and opportunities associated with the health impacts of climate change, and it outlines existing relevant policy, while identifying current and predicted barriers and opportunities associated with responding to the health impacts of climate change. But while the paper acknowledges the ‘ecological foundations for health and wellbeing’ and mentions the fact that many people now live urban, there’s little taken into consideration regarding urban planning and design for health. With many populations now living in urban environments, many people are increasingly removed from a connection with the natural world and with it, the understanding that our health and wellbeing is profoundly dependent on healthy ecological systems as a life support system. Population health depends on ecosystem ‘services’ which provide us with food, and ensure the availability of fresh water, clean air and fertile soil. Increasingly however humans are shaping the natural environment (as well as the climate), and our influence is causing harm to those natural systems on which our health depends. In considering this plan to support health and wellbeing in Queensland, it is important to remember that human health and wellbeing is intimately connected to the state of the natural environment, and thus environmental protection an important element in planning for human health (pg. 4). This made me even more confident of the value of the UTC we are organising at JCU, as I am a firm believer that things identified in Figure 2 (pg 8) of the discussion paper are influenced by the way we think, plan and develop our cities. A lot of good discussions ahead!